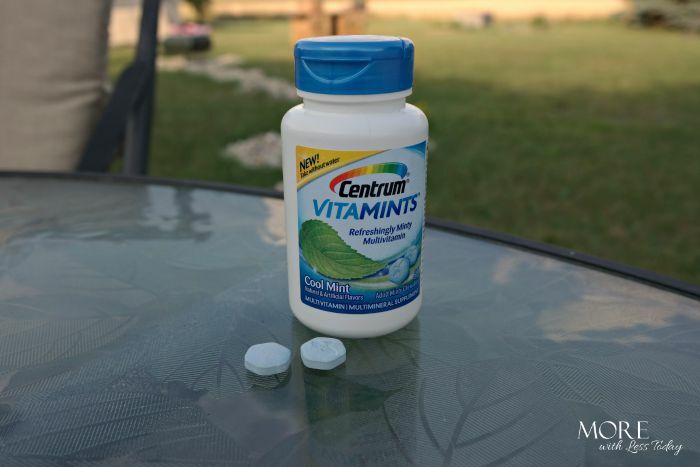 Centrum VitaMints Chewable Vitamins With a Minty Taste – Very Cool! After as many seasons as I’ve seen, you’d think I’d know better by now. With fall sports, homework and school projects and planning for the holidays – the list goes on and on. What’s not on the list? Eating healthy. We do a pretty good job of eating well, don’t get me wrong. Between a toddler with Celiac’s Disease and my corn allergy, eating out is pretty much a no go, as is most packaged food. Still, even with all of that, most American’s (us included) worry about making sure we are getting the nutrients we need to maintain health and energy. Everyone knows that vitamins are a convenient way to make up that gap, but pretty much anyone who’s taken a multivitamin can tell you that it isn’t pleasant, especially on an empty stomach. For me, that’s an express ticket to queasy town. Centrum® has an easy solution with their new VitaMints®. The Cool Mint has got the essential nutrients you need, but they are chewable with a minty taste. The best part is being able to take them with or without food or water, so you can stash a bottle in a backpack, purse or the glove box. They are a complete vitamin that includes the B vitamins, along with vitamin C and E to help maintain energy, immunity and metabolism* by filling in nutritional gaps. Centrum® is the world’s most clinically studied, most recommended and most preferred vitamin brand in America. Now you can enjoy getting your essential nutrients in a mint, at home or on the go. If you would like to learn more about Centrum®’s VitaMints®, you can check out their website at www.CentrumVitaMints.com.